a parcel porter q.v. who drives electrically-propelled truck, conveying passengers' luggage at large railway station. see porter, horse and carriage. has general supervision of booking hall at large station; directs passengers, etc. ; graded as station foreman or as station inspector (700) q.v. according to size of station. an office man q.v. who issues ledgers,. bound volumes of abstracts, returns, invoices, delivery notes, etc., from book room to offices as required, and replaces them when returned; is responsible for general care of book room. a goods porter q.v. wholly or mainly engaged in loading and unloading cases of butter at goods station or depot. a station foreman q.v. who sees that cabmen keep their proper places on station rank; sometimes also calls cabs for passengers. loads and unloads trucks in goods depot; calls-out particulars of incoming and outgoing consignments, from labels on goods, to goods checkers q.v., in preparation for their removal from platform or wagon by goods porters q.v. ; cf. caller (709). moves trucks in goods depot by depressing foot lever actuating automatic capstan to which one end of rope is attached, other end being attached to truck. a porter q.v. who searches railway carriages after arrival of train at destination; removes newspapers and takes articles, left behind by passengers, to lost property office. a goods porter q.v. who loads and unloads cattle at railway cattle dock. a checker q.v. who keeps record of goods deposited in cellar warehouses rented by firms on railway company's premises. a foreman q.v. who' directs and controls checkers q.v. at goods station or depot. checks, by comparing with waybills, incoming consignments as they are unloaded by caller-off and by goods porters q.v. ; checks weight of each consignment against consignment note as called off; records and checks numbers or weights of outgoing goods and furnishes records to goods depot office; sometimes also works jigger, i.e. capstan, whilst checking goods into or out of railway warehouse; sometimes specifically designated, e.g. coal checker, goods checker, grain checker. a checker q.v. wholly or mainly employed in connection with fish traffic; graded as parcel porter q.v. weighs goods as check on weights shown in consignment notes; graded as scaleman q.v. a checker q.v. who is delegated to check goods to be charged on mileage basis. a checker q.v. wholly or mainly employed in connection with milk traffic; graded as parcel porter q.v. a checker q.v. wholly or mainly employed in connection with parcels traffic; graded as parcel porter q.v. a checker q.v. who checks loading and unloading of rulleys, i.e. drays. a checker q.v. working on platform of goods shed, checking goods into and out of trucks and vans. a checker q.v. who checks contents of goods wagons with list shown on wagon slip. in charge of small staff of number takers q.v. at goods depot; is responsible for seeing that records are properly kept and for general supervision of work. receives luggage from passengers, issues vouchers, and receives booking fees; stores luggage on racks and returns it to owners on production of vouchers; makes returns and hands cash receipts to station master (700) q.v. or to cashier (939) q.v. ; is sometimes assisted by porter q.v. a porter q.v. who carries letter despatch bags from one department of railway office to another, or between despatch office and trains. sprays cattle pens and cattle trucks with disinfectant. (ii) a goods porter q.v. employed at seaport clocks owned by railway company. cursorily examines passengers luggage entering station and weighs it, if necessary, to see if over weight allowed free; collects excess charge where due, and issues excess slips; labels luggage and sometimes assists in loading it into guard's van; passes cash receipts, with vouchers, to station master (700) or to cashier (939) q.v. a parcel porter q.v. who weighs parcels in parcel despatch office, and surcharges any that are underpaid. attends to fish in transit discharging boxes, baskets, etc., at stations en route; renews ice when necessary, etc. ; graded as parcel porter q.v. a station foreman q.v. who supervises porters q.v. directs passengers to platforms, etc., in a booking hall or station approach. a station foreman q.v. who directs and supervises excess luggage collectors q.v. and is responsible for efficient performance of their work. superintends loading and unloading of fish at a railway goods station or fish depot; graded as parcel foreman q.v. directs and supervises goods porters, checkers, callers-off, loaders q.v., etc., at a railway goods station or depot, or section thereof; is responsible for efficient performance of their work. a station foreman q.v. who directs and supervises porters loading and unloading horses, carriages, and dogs at a horse and carriage dock. a station foreman q.v. in charge of men loading and unloading horses at railway depot or quay. a station foreman q.v. in charge of lamp-room at large railway passenger station; supervises lampmen q.v. ; sees that lamps (mainly oil tail lamps) are properly cleaned and trimmed; is responsible for efficient working of lamp-room. a station foreman q.v. who directs and supervises luggage porters q.v. at a station, or on one platform, or in luggage room, of a station. directs and supervises milk checkers and milk porters q.v. and other men handling milk traffic at a railway station; graded as parcel foreman q.v. directs and supervises parcel porters q.v. attached to station parcel office; is responsible to parcels inspector or to station master (700) q.v. for expeditious handling of incoming and outgoing parcel traffic. a parcel foreman q.v. in charge of parcel post traffic. directs and supervises porters q.v. on one particular platform; sees to handling of luggage; directs passengers, etc. ; graded as station foreman q.v. a platform foreman q.v. who is also engaged, in a supervisory capacity, in general work of station; graded as station foreman q.v. a parcel foreman q.v. who supervises work of staff at town railway receiving office, i.e. an office at a distance from station, where goods and parcels are received for despatch by railway. in charge of a link, or number, of porters q.v. in one block of work on station premises and occasionally works with them; is responsible to station master (700) or to station inspector (700) q.v. for efficiency of his block. 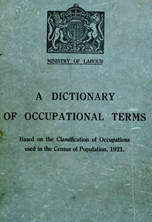 obsolescent; now graded as general foreman (goods), locomotive foreman (700), working foreman, or yard foreman (704) q.v., or as foreman in connection with specialised traffic, e.g. fish foreman q.v. sees that label boards, showing destinations of trains, are affixed to railway carriages before train starts; sorts and stores label boards in cupboard rack at terminus. part of time directs and supervises goods porters, loaders, shunt horse drivers (704) q.v. and other manual workers at goods depot; is responsible to yard foreman (704) for efficient performance of block of work under his charge, but is employed more than half-time in non-supervisory duties. a working foreman q.v. in charge of gang of labourers working in goods depot. a porter q.v. who sounds electric gong on platform and in refreshment rooms of station, to warn passengers of approaching arrival or departure of train. sweeps out and cleans goods brake vans after journeys, and sees that vans are kept properly equipped; graded as porter, goods porter q.v. at passenger stations and goods stations respectively. a porter q.v. who attends at roadside halt, where there is no proper station staff; collects tickets from passengers alighting; issues tickets as far as junction to passengers entraining; work often done by travelling porter q.v. a leading porter q.v. in charge of transfer porters q.v. or of a section of them; is responsible for proper carrying out of arrangements for transfer of luggage from one station to another station close by. a horse and carriage porter q.v. who cleans out horse boxes with shovel and broom; puts in fresh straw, etc. a goods porter q.v. who receives invoices of goods despatched from goods office, and places them in small receptacle on side of wagon or truck containing these goods. a goods porter q.v. who detaches invoices from goods wagons or trucks on arrival at destination, and takes them to delivery office. a checker q.v., on delivery side of goods station, who checks goods on arrival with invoices forwarded by sending station. a station lamp man, or lad, q.v. who keeps incandescent gas lamps, made on Kitson and Empire system, in good order. keeps label cabinet replenished with labels, paste, etc., and assists luggage labeller q.v. generally; graded as porter q.v. a porter q.v. detailed to put labels on railway coaches, indicating destination, or on carriage windows, indicating that they are reserved, etc. ; also chalks up place of disposal of coach when journey is ended. a porter q.v. who pastes labels showing destination on passengers' luggage. a goods porter q.v. who attaches labels, showing route and destination, to goods (usually coal) trucks; obsolescent. cleans, fills, trims, lights and extinguishes at specified times, portable lamps used in station, passenger train rear lamps and passenger carriage roof oil lamps, where used; removes lamps on barrow to and from lamp room; at some stations, performs similar duties in regard to fixed oil or gas lamps, where not done by carriage and wagon department. a porter (grade II) q.v., in small station or depot, who cleans and lights lamps and cleans points along a certain section of permanent way or siding; obsolescent. a lamp man q.v. engaged in cleaning, trimming, and filling lamps for use on goods brake vans. is responsible for cleaning, filling, trimming, lighting and extinguishing of oil signal lamps, arm or disc, on signals or shunt signals at station or depot. a porter q.v. who cleans floors, washbasins, urinals and w.c.'s at a railway station; collects fees for use of wash-basins, etc. directs and supervises cloak' loom attendants q.v. at a large station, and works with them. directs and supervises lost property office attendants q.v. at a large station, and works with them. directs and supervises parcel porters q.v. and works with them at a parcel office not large enough to justify employment of a parcel foreman q.v. a working foreman q.v. in charge of small staff of porters q.v. where no station foreman q.v. is employed; is responsible to station master (700) q.v. for carrying-out of jobs done by staff under him. sorts, at large railway station or depot, railway correspondence delivered by guards (702) q.v. of incoming trains or received from station offices; makes them up into packages, for delivery by porters q.v. to various departments or to guards of outgoing trains; at small depots both sorts and delivers railway correspondence. a porter q.v. in charge of linen room at passenger station; issues clean sheets for sleeping berths and towels for lavatories of passenger trains; receives soiled sheets, etc., and is responsible for their being sent to laundry; keeps record of linen issued and returned. a goods porter q.v. who adjusts loads on goods wagons where loads have shifted or where they will not pass gauge. stands in wagon during loading; receives packages of goods from goods porters q.v., stows them securely and conveniently for delivery at stations en route. a porter q.v. who loads passengers' luggage in guard's or luggage van, and stows it so as to be easy of access at intermediate stations. a goods porter q.v. who loads goods into road motor wagons at railway goods depot. a goods pointer q.v. wholly or mainly engaged in loading or unloading timber, either sawn or round (i.e. trunks, logs); secures timber in place on wagons with chains; sometimes specifically designated, e.g. round timber loader. a goods porter q.v. employed in loading or unloading goods, into and from wagons, in a railway company's warehouse. a checker q.v. who records total weights loaded on wagons. receives lost property collected from passenger coaches by porters q.v. ; receives correspondence regarding lost luggage and submits suggested replies to station master (700) q.v. ; issues reclaimed property to rightful owners direct, or forwards it, on owner's request, to some other station; keeps record of lost property received and issued and passes cash receipts to station master. a goods porter q.v. who handles carcases at railway meat depot as directed by general foreman (goods) q.v. records gross weights of railway trucks, containing minerals, as they pass over machine; notes also tare of each wagon and nett weight of contents prior to despatch; if at receiving station, checks weight on arrival with that shown on invoice; graded as weighbridge man q.v. records, for transmission to Railway Clearing House, numbers of privately owned, non-common-user, wagons and of foreign wagons, i.e. belonging to other companies, entering or leaving goods depot. receives incoming invoices, advice notes, etc., at goods depot and stamps them with serial numbers; circulates invoices to checkers q.v. ; after invoices, etc., cleared by clerks (939) q.v., pastes them into invoice book, advice book, delivery book, etc., in serial number order, and files them for reference; is responsible for custody of invoice books, etc. sorts parcels in railway parcels office for despatch according to stations, or for delivery, by carmen (719) q.v. a porter q.v. who records numbers and other particulars of passenger rolling stock belonging to another railway company on its arrival at or departure from a passenger yard. a porter q.v. who issues pillows to passengers on night trains on payment of a small charge; collects pillows from trains at terminus; may also do work of rug porter q.v. a porter q.v. who stands on platform of an electric railway and attends to closing of carriage doors or gates and to marshalling of passengers, e.g. away from entrance to avoid congestion. see lampman and point cleaner. in passenger department, duties, especially at small stations, are multifarious, but usually include some or all of following; (grade 11) carries passengers' luggage from station entrance to platform or vice versa; labels luggage and puts it in luggage office; removes luggage of arriving passengers from van; calls-out destination of train as it approaches station and name of station while train stands therein; shuts carriage doors as trains depart; unfastens couplings and brake connections when train has to be divided and couples them up when two or three portions of train have to be united; searches carriages, on arrival of train at destination, for luggage and parcels left therein; supplies rugs, pillows and linen to travellers on night trains; loads or unloads parcels, luggage, milk cans, etc., into guard's van, or into special vans or trucks; cleans station platforms, waiting rooms, booking office and other station premises; removes old time tables from time table boards and pastes up new ones; often also acts as lampman and sometimes as ticket collector (705) q.v. and in various other capacities; (grade I) is engaged chiefly on more responsible work, e.g. issues tickets at small stations (but does not do clerical work); at large stations does specialised work, e.g. coal porter, train indicator porter q.v. ; in goods department, or where duties are specialised is usually specifically designated e.g., goods porter, parcel porter, horse and carriage porter q.v., etc. a goods porter q.v. who transfers goods from one truck to another in transferring area (basin) of a large goods depot or junction. a porter q.v. who also acts as booking clerk (939) q.v. at small station. travels with, and carries, special boxes which are used for transport of cash between stations and head office. see cloak room attendant (male). assists in clothing or uniform store of railway company; cf. porter, equipment. a porter (grade I) q.v. who fetches coal for fires in waiting-rooms, booking offices, etc., of a railway station. (ii) see cloak room attendant. assists in railway equipment stores; cf. porter, clothing. a railway porter q.v. wholly or mainly engaged in loading and unloading fish into and from railway vehicles; cf. fish porter (745) (759). a railway porter q.v. employed at railway goods stations and depots in loading and unloading goods trucks, sweeping goods yard, cleaning cattle pens and wagons, carrying messages, attaching and detaching truck labels, etc. a goods porter q.v. wholly or mainly engaged in handling grain. attends at entrance of a railway station; assists passengers with luggage; answers enquiries, etc. loads and unloads horses, show cattle, and dogs when not sent as parcels, carriages, motor cars, theatrical scenery, etc. at passenger station sidings; cleans empty horse boxes, disinfects with sprayer and lime washes for future use; sometimes acts part time as porter or parcel porter q.v. (ii) slang, see capstan man. a porter q.v. under age of 20.
handles lost luggage; graded as porter, lost property office attendant q.v., respectively, when engaged mainly outside, or inside of lost property office. attends to passengers' luggage; sorts it out as receive! from van; helps in loading; wheels it to luggage room, etc. a goods porter q.v. who works in a railway market, carrying, loading, and unloading goods. a goods porter q.v. who handles goods charged on a mileage basis, assisting mileage checker, etc. a parcel porter q.v. wholly or mainly engaged in handling milk churns at a station. a porter q.v. employed, in any capacity, regularly on night duty. meets incoming and outgoing passenger trains to receive and deliver parcels, including milk churns, fish boxes, vegetables and general merchandise sent at passenger train rates, by hand truck or electric trolley; weighs parcels received over counter or unloaded from vans and calls-over weights to parcels clerk (939) q.v. ; places parcels in racks in readiness for despatch; assists horse or motor parcel vanmen (719, 720) q.v. in loading van for town delivery and does other porterage work in parcels office under direction of parcels clerk. a parcel porter q.v. who accompanies a railway delivery van and distributes consigned parcels; takes receipts and collects cash when necessary. a parcel porter q.v. who attends to loading and unloading of G.P.O. parcels vans at a railway station. helps load or unload G.P.O. mail bags. a parcel porter q.v. delegated to work in town parcels receiving office; moves and stacks parcels, etc., in office; loads into collecting van. a porter q.v., attached to a district office, who takes place of porter absent at any station in his district through sickness, holiday, etc., or who helps at any station when traffic is unusually heavy. a porter (grade II) q.v. who assists rolling stock inspector (700) q.v., e.g. visits parts of station sidings, etc., to obtain particulars, number and type, of carriages available. has charge of and issues rugs to passengers on payment of fee; sometimes also does work of pillow attendant q.v. a goods porter q.v. handling scrap metal. a parcel porter q.v. who receives and issues parcels sent by shops and stores to await call of customers. cleans and attends to heating of porters' room at a railway station or depot. assists in time-bill office; packs up time-bills and notices for despatch to stations, etc. indicator attendant, telegraph man, train indicating board attendant; operates train indicator board, which shows times of departure of trains, stations called at, etc., by altering clocks and/or using chalk and blackboard; may also chalk-up details of trains late, etc. G.W.R. only, places label boards, showing destinations, in slots on sides of railway carriages before departure of trains; other railways, work done by ticket collector (705) q.v. (ii) a goods porter q.v. who transfers goods from one train to another for despatch to a station on a different line. a parcel porter q.v. who travels in luggage van to sort parcels en route. a goods porter q.v. working in a goods yard; loads, unloads and cleans wagons; obsolescent. a checker q.v. employed at a small receiving office in towns, e.g. London; receives parcels, issues receipts, assists in loading collection or delivery railway vans. splices hemp ropes to capstan chains in goods depot; maintains ropes in repair; sometimes also records metal tally numbers of incoming and outgoing foreign ropes, i.e. truck ropes belonging to other railway companies, and arranges for their return to home stations. a lad who, under direction of capstan man q.v., fastens and unfastens rope to and from wagons during shunting. a goods porter q.v. responsible for care and issue of sacks at a depot, e.g. in agricultural areas, handing hired-out sacks to farmers and receiving same when returned; counts, stacks and examines sacks for repair; keeps records and sends returns to sack superintendent (700) q.v. ; obsolescent. weighs goods packages on beam scale on goods platform and calls out weights to checker q.v. ; removes packages from scale for disposal by goods porters q.v. a checker q.v. undertaking more responsible checking of goods loaded or unloaded into or out of railway trucks and into or out of foreign warehouse, i.e. warehouse not belonging to railway company, or a cold storage depot. folds and stores tarpaulin sheets removed from wagons. employed at night; stationed in a cabin some distance above point at which shunters (704) q.v. operate, reads numbers on wagons released for shunting and turns an indicator to inform shunters of number of siding or platform to which wagons should be shunted; when not so engaged, does work of porter (grade I or II) q.v. a porter q.v. employed on sidings where goods, e.g. milk, general farm produce, are delivered to farmers, etc., direct from goods wagons; obtains signatures for goods received; chiefly engaged in loading, unloading goods wagons and other work normally done by goods porter q.v. ; graded as goods porter who, in country districts, normally does such work. a goods porter q.v. who fastens rope, chain, or wire sling round goods to be lifted by crane and hooks on to crane; obsolescent. a leading porter q.v. who performs ordinary work of porter, e.g. carrying passengers' luggage, closing carriage doors, calling out names of stations, and who also has special duties, e.g. care of waiting rooms, work at horse docks, etc. a porter q.v., if employed at passenger station, or a goods porter q.v., if at goods depot, who scrubs and sweeps floors of offices and waiting rooms, cleans windows, sweeps platforms, etc., on a railway station. a loader q.v. who works in railway goods station or depot, stowing goods in order in which they are to be delivered. a porter q.v. who attends to telephone in railway office or station; sends and receives messages, etc. measures timber to be transported by rail, and checks results with figures given in consignment notes or invoices. traces and searches for missing packages of incoming goods; makes appropriate entries on invoices when traced or otherwise. a porter q.v. whose only duty is to call out destination of a departing train, names of intermediate stopping stations, and parts of train allotted to such stations; also calls out name of own station on arrival of trains. a porter q.v. who records scheduled and probable times (if late) of arrival of trains and No. of arrival platform on indicator board at railway station, cf. train recorder (703). a porter (grade II) q.v. who is detailed to give starting signal, e.g. rings bell denoting time of departure, on large platform. a porter q.v. who operates, by hand or power, a traverse table on which locomotives or rolling stock are conveyed laterally from one set of rails to another; usually done by capstan man q.v. ; obsolescent. a goods porter q.v. who transports goods from one part of goods platform to another on a hand-truck. see goods brake van cleaner. moves drays, by horse if necessary, along goods platforms at night so that they can be loaded in readiness for carters (719) q.v. to take out on arrival at depot; sets, or places, loaded drays to facilitate manipulation by carters and to avoid delay in starting delivery round; cf. van setter (729). a goods porter q.v. who washes out and lime washes cattle wagons and pens; cf. disinfector. a loader q.v., or, at small depot, a goods porter q.v. who trims coal on loaded wagons to prevent its falling off when truck is in motion; obsolescent. a goods porter q.v. who unloads goods from trucks in railway company's warehouse. operates weighbridge; calls out weights to weighbridge clerk (939) q.v. or records weights himself.